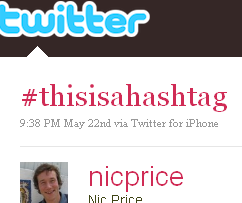 Posted byNic Price	 27 May 2010 Leave a comment on What is a hashtag? A hashtag is a type of label (or metadata) that you can include as part of a message on sites like Twitter. It then allows people to follow mentions of the term you’ve hashtagged, if they so desire. One of the most common uses of hashtags I’ve seen (and used) is around a live event, for example a conference or a Grand Prix race. It’s a hashtag because of the # sign used as a prefix. A hash, followed by a tag. Some software (such as Tweetdeck, a Twitter client) is programmed to look for hashtagged terms, and turn them in to hyperlinks to the latest posts which also use the same hashtag. You might have notice that at the start of the BBC’s TV programme Later with Jools Holland, the term #laterjools is shown on screen. This is a way to share the “official” (or suggested) hashtag for that particular subject or event. You can see all #laterjools at http://hashtags.org/laterjools. You can’t put spaces in hashtags, and it’s best to avoid trying to use any punctuation. Having no rules, and being an open system, leaves it open to abuse by spammers and marketers. You’ll sometimes find popular hashtags being hijacked with messages tempting you with links to increase your endowments.